The clothes ministers wear in an Episcopal worship service are called vestments. Why do they wear that stuff? 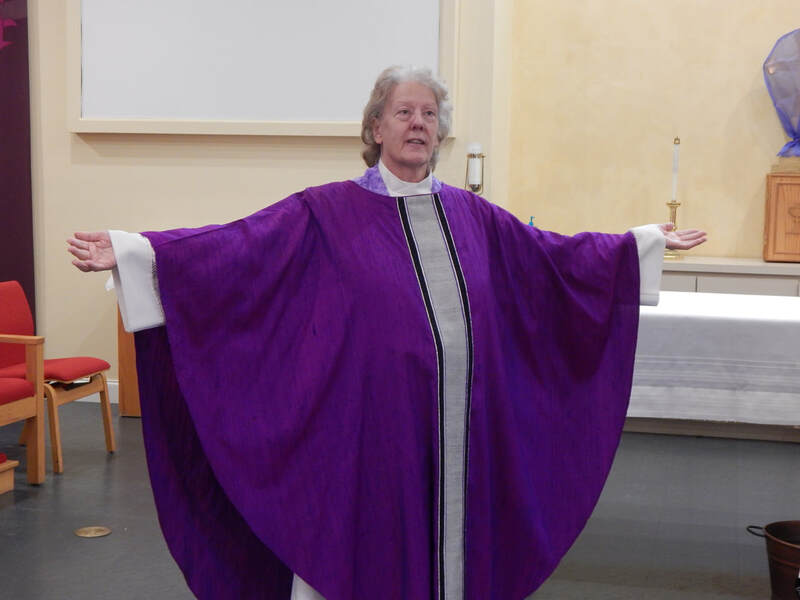 First, vestments lend dignity to a worship service. The clothes then are about the role the person fulfills in the worship service rather than their personal taste in clothes. This is as true for the acolytes and other servers as for the priest. What do the items signify and where do they come from? Strictly speaking, a cassock is not a vestment as they were for quite a long time traditional street wear for priests. The long black robe (sometimes red for acolytes and for special services) are usually worn in a service under a white garment called a surplice. The photo at right shows acolytes (kids assisting with the service) in red cassocks with white surplices, the Lay Eucharistic Ministers (non-ordained members of the congregation assisting in servings communion) in albs and the pastors in albs with stoles. The pastor at right is Barb Gibson of Joy Lutheran, taking part in a joint service with King of Peace. This is the white robe worn by those serving during a worship service (shown below on the priest at right). 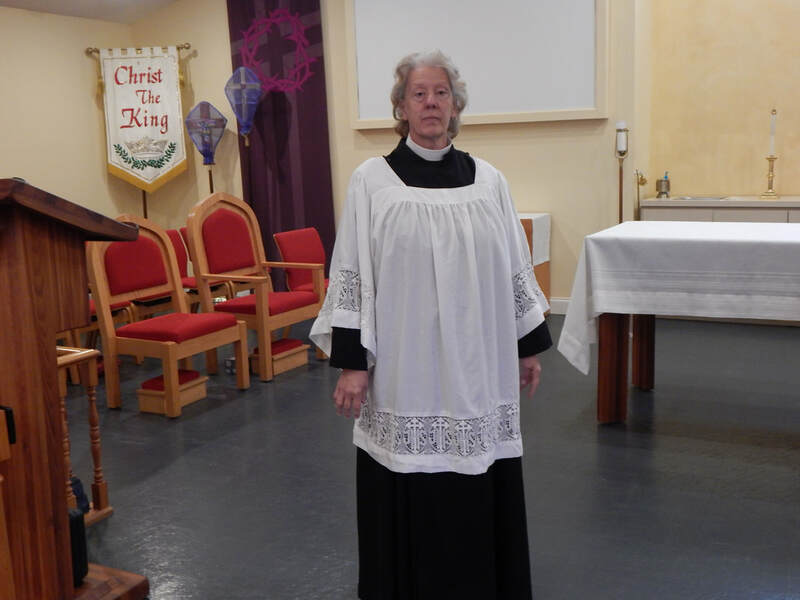 Wearing robes is not just a quaint custom, it allows people who have come to worship without concern for the clothes the pastor and others who are serving are wearing. It is about the role in the service, rather than the whims of fashion. This is worn over the shoulders of the pastor and other ordained persons. Historically it comes from the Jewish prayer shawl and is a sign of leadership in the service. Both deacons, priests, and bishops all wear stoles. 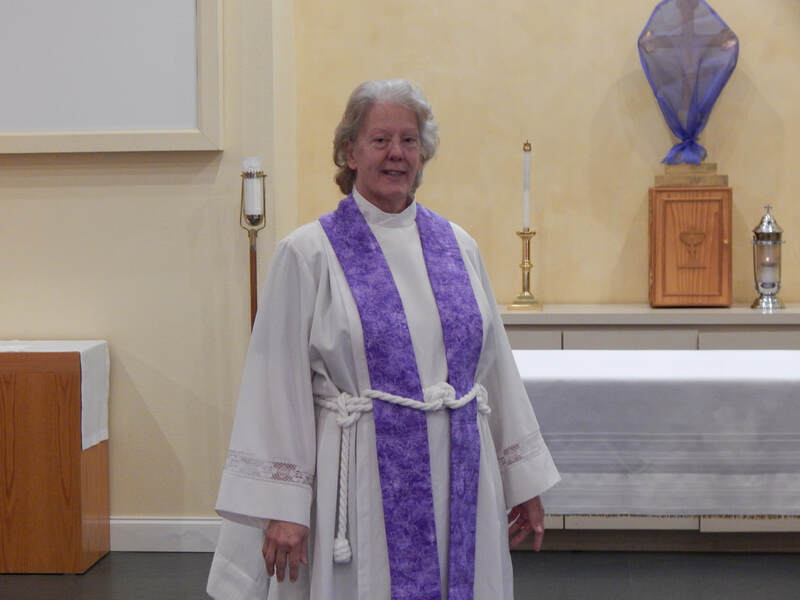 A deacon wears the stole over the left shoulder, across the chest and tied under the right arm. Priests and bishops wear stoles around the neck with the ends hanging in front. The color and design are selected to go with the season of the church year. This is a poncho like overgarment worn by priests (shown at right) during a communion service. Historically it was the type of cloak or overcoat worn during the time when Christianity became the official religion of the Roman Empire. The color and design of the chasuble, like the stole, depend on the season.